1Litherland N. Got a fresh cow pen? University of Minnesota Extension. 2011. Available at: https://www.extension.umn.edu/agriculture/dairy/facilities/got-a-fresh-cow-pen/. Accessed March 22, 2018. 2Arthur L, Nolan D and Amaral-Phillips DM. Managing transition dairy cows. University of Kentucky, Department of Animal and Food Sciences (Dairy Extension Services). Available at: https://afs.ca.uky.edu/dairy/managing-transition-dairy-cows. Accessed March 20, 2018. 3Kieser L. When to assist with calving. University of Minnesota Extension. 2013. 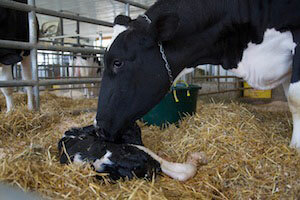 Available at: https://www.extension.umn.edu/agriculture/dairy/health-and-comfort/when-to-assist-with-calving/. Accessed March 20, 2018. 4Arthur L, Nolan D and Amaral-Phillips DM. Fresh–dairy cow management. University of Kentucky, Department of Animal and Food Sciences (Dairy Extension Services). Available at: https://afs.ca.uky.edu/dairy/fresh-dairy-cow-management. Accessed March 22, 2018. Accessed March 22, 2018.